This 1934 Lady’s Hercules is fitted with a rare Watsonian Juvenile sidecar in superb condition. It’s the ideal set-up for enthusiasts of thirties costume and accessories, as well as those who enjoy interesting obscurities from Great Britain’s wonderful motoring history. The sidecar is remarkably well-preserved. I had all threee windows replaced. The body, chassis, interior and fittings were already in excellent condition. The sidecar has been well fitted to the bicycle. There are two fitting bolts and, in addition, it bolts to the spindle. The hood clips over the sidecar in case of rain. The bicycle has been serviced, and it functions as it should. I’ve road-tested it, and found the brakes a little weak, though that’s indicative of the type of bike; they do actually work. I should mention that riding a sidecar outfit takes some practice. Sidecar riding is a lost art. 1. You have to lean into bends, ie sidecars do not steer around corners, the bicycle drags it round. 2. The added drag of a sidecar means the bicycle pulls to the left when riding in a straight line; traditionally one rests only the right hand on the handlebars to even the pull. The Hercules has been repainted at some time in its life. It’s well-preserved for a 60-year-old. 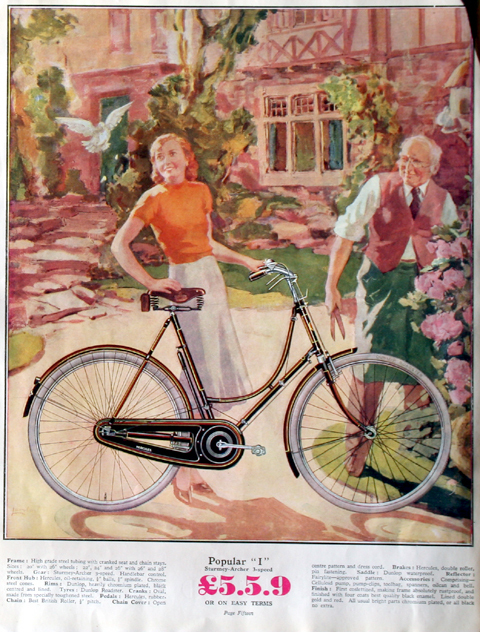 I became interested in Hercules bicycles after researching the history of the British bicycle industry, and seeing how Hercules took on the establishment …to become the largest producer in its day. The company produced the cheapest well-made bikes, which in itself is not such an easy image to promote. But they created such glorious images in their catalogues that I find it hard not to be impressed. 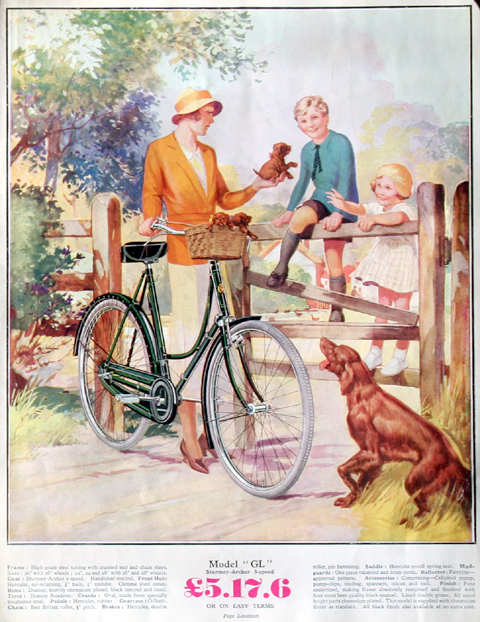 As you may observe from the 1934 catalogue picture below, puppies might have been an optional extra. 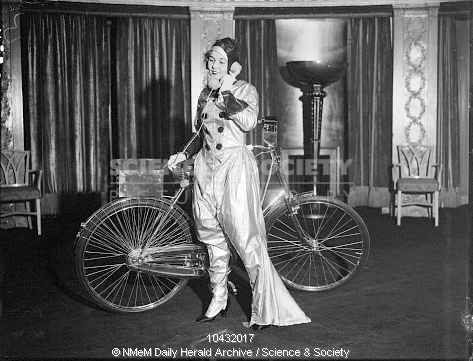 Below you can see a photograph of a futuristic cyclist, taken by Edward Malindine for the Daily Herald newspaper on 29 November, 1933. This photograph was taken at a pageant held at the Dorchester Hotel, London, to celebrate the history of the Hercules Cycle Company. This is a prediction of what the well-dressed cyclist would be wearing in 1940 to ride her ‘wireless cycle’, which came complete with telephone. Tyres are 28 x 1 1/2. The saddle is a Lycett L20 Ladies Model. Here’s a close-up illustration of the sidecar fittings to the bicycle. The sidecar retains its Watsonian emblems. The sidecar seat is very basic, being a hammock type of arrangement. Some of my bikes work for a living. A magazine hired the Hercules and sidecar for a fashion shoot. Here are a few of my pictures of the shoot (and of my daughter who came along to see what was going on and couldn’t resist trying out the sidecar.